Jalapenos are abundant right now, but that’ll change very soon, when fall starts to chill the fields. 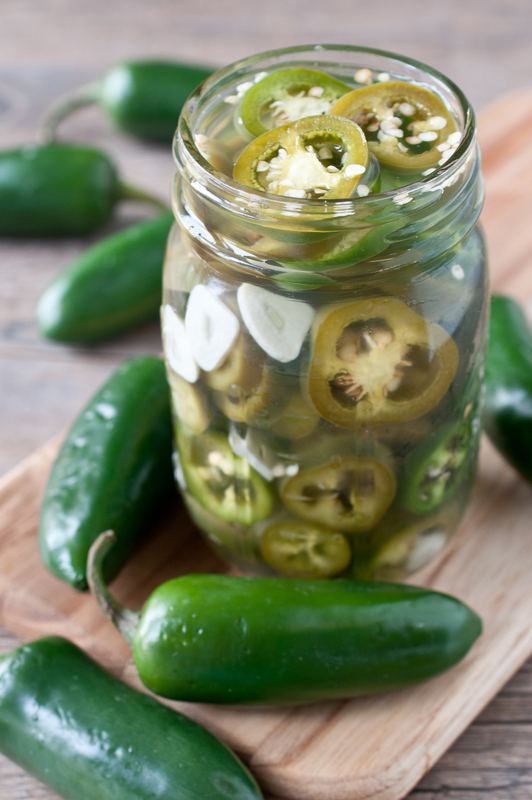 I love the brightness of fresh jalapenos, but pickled jalapenos are a staple. Once I figured out how incredibly easy and cheap it is to make my own, I’ve never gone back. I even learned how to water bath can just so that I could make these in giant batches! The tricky thing about jalapenos is that the heat level varies wildly, and there is no way to tell how hot an individual pepper is. But the good news is that most of the heat in the jalapeno is in the seeds and the membrane in the middle of the pepper, removing all or some will give you control over the final burn. Once you have yourself a giant batch of beautifully pickled peppers, there is an enormous amount of uses from quesadillas to burgers, I just can’t get enough. Slice the jalapenos into ¼ inch rings. Remove all or none of the seeds, depending on desired heat level (the more seeds left in the peppers, the higher the heat level). In a pot over medium high heat, add the water, vinegar, sugar, salt and garlic. Cook, stirring frequently, until the sugar and salt have dissolved, remove from heat. 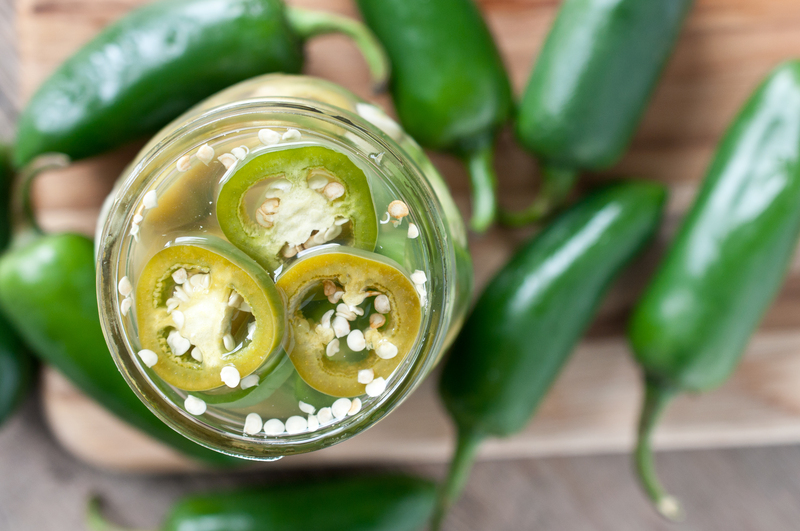 Allow to cool to room temperature before adding the jalapenos. Place peppers and pickling liquid in an airtight container, such as a canning jar, refrigerate for 4 days and up to three weeks. I can’t believe the perfect timing of your post! I just got tons of jalapenos from my FIL and was going to look for pickled jalapenos recipe. And here it is! Yay! Thanks, Jackie! As Anna said, perfect timing! Jason and I were in Santa Barbara today eating this amazing California Burrito but they’re pickled jalapenos sucked so we can’t wait to make our own! Do you think these could be canned? Yes. I canned a huge batch of these using a water bath canning method, worked great. Pickled jalapenos are the perfect burger topping!! Love this!! SHUT UP it is that easy to make pickled jalapenos?!? I am all over this. And I know exactly what you mean about the jalapenos. I’ve had some that are so hot that they made me cry. Then others that made me double check to make sure I didn’t buy a bell pepper instead. I prefer the spice so I always leave the seeds in…what’s a few tears? I LOVE, LOVE, LOVE pickled jalapenos! It’s kind of a joke with my friends because at a Mexican restaurant I eat one with every bit of my food. 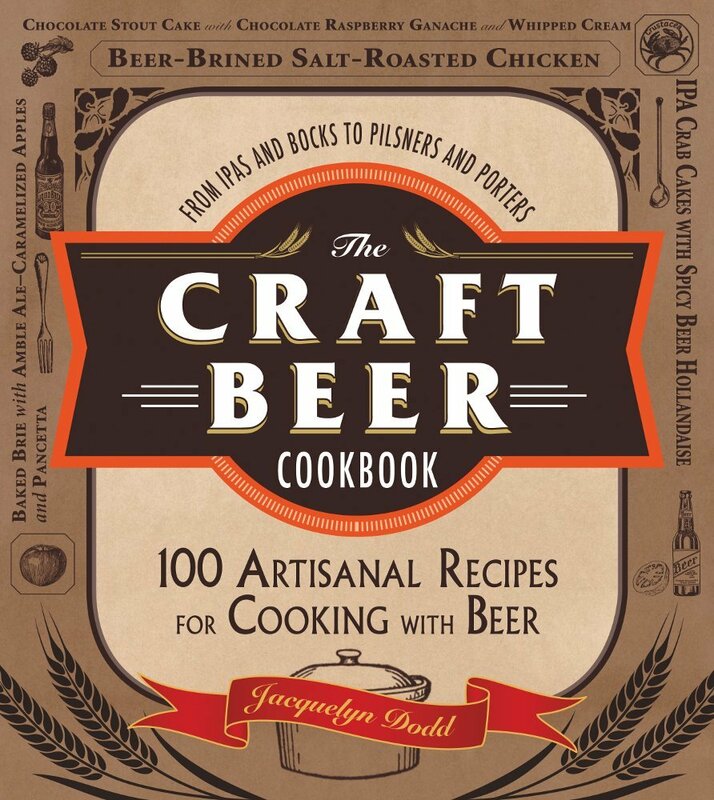 I can’t wait to try to make my own. Great recipe! I also can jalapenos, but my recipe and method are even more simple! Bring seals to a boil and seal jars. Wait 6 weeks and they’re ready to eat! How long can you keep these??? A really long time in the fridge, months even. If you water bath can them they’ll last years. Thank u Barbara I like ur way, I didn’t want to use sugar. I’m going to make them today. Getting ready to make them today, i want to water bath them but not sure how long to let them cook.